Smoother than Nigel Havers in silk pyjamas, 'Sands Of Time' is an album that harks back to 1989 – in an entirely good way – and represents an unexpectedly pleasant surprise. 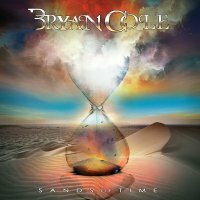 Of the eleven tracks on this, Bryan Cole's debut, just two are his own compositions (with writing partner DJ Gleason), alongside numbers penned by Jim Peterik (Survivor), Brett Walker and more. Happily, there's a consistency across the tracks that's sometimes absent when songs by different writers rub shoulders. Opener 'Burning With A Reason' brings to mind one act in particular... Giant. Not too much of a surprise when you read that Cole counts Dann Huff as a key influence. Like Huff, Cole also handles both lead vocals and guitar, while the bassist here is Mike Brignardello, formerly of... Giant! What instantly impresses, and continues to do so throughout the album, is Cole's dazing ability to effortlessly summon fluid, mellifluous lead guitar breaks in a manner not dissimilar to the aforementioned Giant talisman, while his made-for-AOR voice suits the material here perfectly. It's hard not to imagine one of those semi-music video moments that cropped up on Baywatch whilst listening to the likes of 'Hard To Find An Easy Way' or 'Courage To Love', but then surely that's a sign that Cole's vision is bang on target – Nine Inch Nails-style nihilism it certainly isn't! On 'We Lost The Fire' the Giant comparisons raise their head again as the similarity to that band's song 'Chained' is more than uncanny. There are two ways you can view this, as plagiarism or a lovingly-crafted tribute. I'd suggest the latter without hesitation, and with no small amount of gratitude, as the likelihood of Giant producing new music is slimmer than your pub footy team winning The Premier League! Personal favourite goes to 'Is It Really Love', a short and sweet hit of sun-kissed up-tempo AOR that brings out the sun whatever the weather – not unlike the rest of this quite splendid album.